It’s the season to take stock, count up, measure out, pledge, promise and decide. I’ve made resolutions for the first time in five years and on my list is ‘read more poetry’. Expert resolution-makers say that simply vowing to do more of something is cheating. But I’m happy with my slightly vague ‘more’ and whoever said that poetry consumption should be calibrated, anyway? 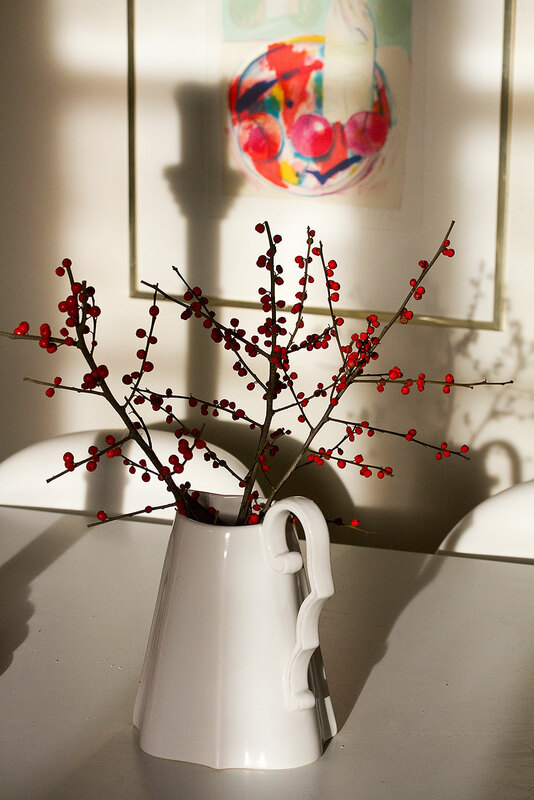 Stems of fresh red berries on my kitchen table are throwing a new shadow on the wall, but the silhouettes of the Christmas candles are still there too. It’s that time of year when old passes to new and, for once, we actually take note. With all the frenzied mental measuring that’s been going on, I wasn’t in the mood to do too much weighing and measuring in the kitchen. 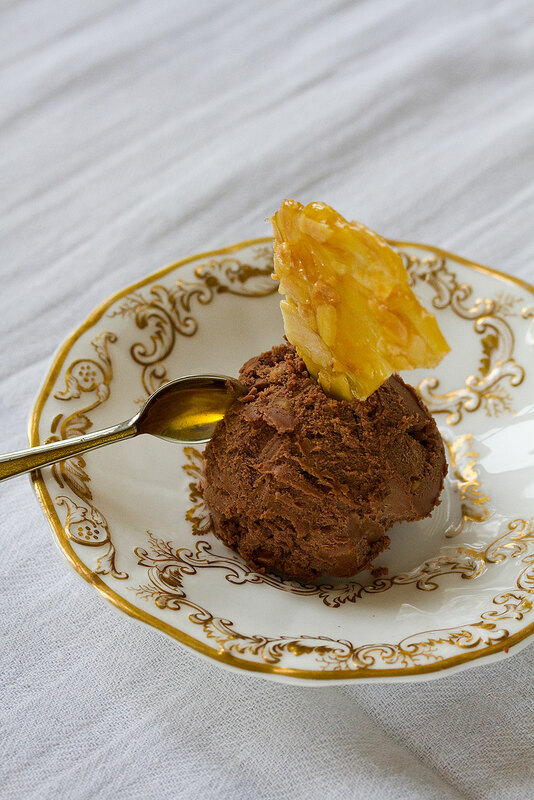 For times like this, I have the perfect recipe….. Chocolate and Crunchy Peanut Ice-Cream. It’s an adaptation of a David Lebovitz recipe, from his inspiring but dependable book The Perfect Scoop. In fact, while I’m on the subject of New Year’s resolutions, to aim to be both inspiring and dependable sounds ideal. I may add that to my list. This is the kind of recipe that you can make while reading a book of poetry at the same time, so easy and memorable is it. A cup of this, a half cup of that and you’re almost there. Tip all the ingredients, apart from the peanut butter, into a pan. Over a moderate heat, stir with a whisk and bring briefly to a hearty simmer. It will bubble up in the pan, at which point take off the heat. 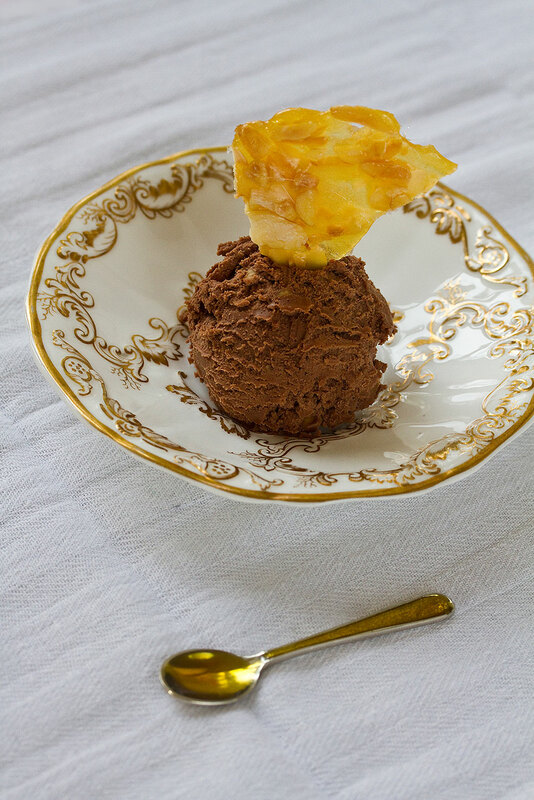 Mix in the peanut butter, allow to cool and churn in an ice-cream maker. It’s as easy as that. My children have asked if I will make a New Year’s resolution to create it even more regularly than I already do. If in fanciful mood, make some almond brittle to poke in the top. Toast the almonds in a small non-stick frying pan. Put to one side. Pour half a cup of caster sugar into the same pan. Without stirring, heat the sugar and swirl it around the pan until it melts to a light caramel liquid. It burns easily and also gets ferociously hot, so be careful. Stir in the nuts and quickly spread out onto a piece of baking parchment with a palate knife. It will set almost immediately. Snap off a piece to suit your appetite and your conscience. To my mind, the true measure of a good piece of brittle is that it should be translucent enough to read a poem through it. That way, if your New Year’s resolution is the same as mine, you can have your cake while reading it at the same time. And who could argue with that? Inspiring and dependable – I think you’ve achieved it. A jewel of a post to start the new year – hope 2012 is a happy one. Achieved a resolution by January 4th? How wonderful. Thank you, as ever, Sally for your generosity – it’s hugely appreciated. And I hope 2012 is a great year for you. Thank you, Jamie, for your wonderful words. And yes, that’s a deal. The ice-creams are on me. Happy New Year to you too. I’m not surprised this goes down well at home as it looks so delicious. Thanks Jakey – and yes, it really is good and so simple and quick to make. So inspired I need to go and invest in an ice-cream maker. Can you suggest please? Thanks for the tip am now off to search for one! Ok, took delivery of the ice cream maker just now, got ingredients ready but …. Not having cooked using cup measurements before need further assistance please. Any cup? Do I assume this as long as I’m consistent? Or does it need to be a particular size ? Sorry to ask what to serious cooks might sound pathetic Q but …am not a serious cook! I hope you enjoy your new ice-cream maker. Cups are an American form of measurement, so they’re not just any old cup. But as long as you keep the proportions the same, you will be ok. Think of an American cup as more or less the size of an old-fashioned teacup. That ice cream looks far too delicious to be good for me! My main resolution this year is to do more…eating well. However, resolutions are good to give up for Lent! Love your blog! I’m so glad you like Eggs On The Roof – your comment is hugely appreciated. And what a great idea about Lent – perfect! 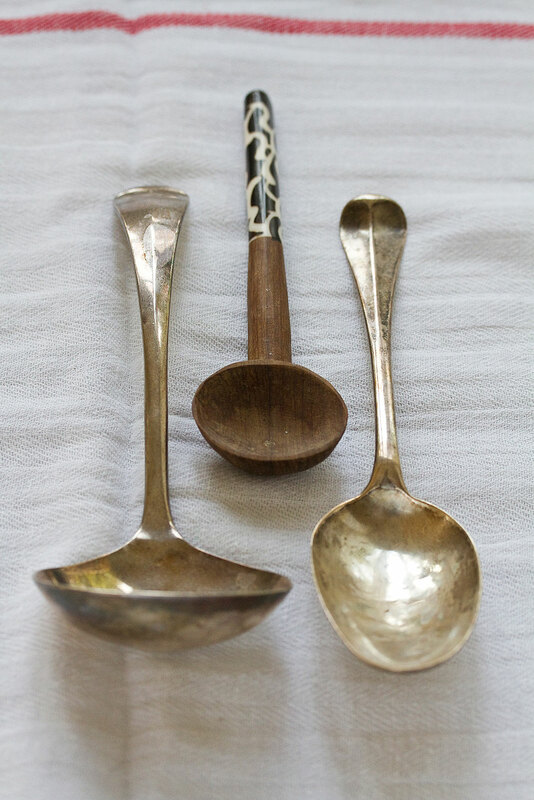 OK, never mid the ice-cream – I am struck down with serious prop envy (again!) – that BOWL! Come to think of it, I’m pretty envious of your translucent brittle too 🙂 As for poetry, to read more has often been on my list of resolutions – I have a shelf of much-loved poetry books at home that often do not get the attention they deserve. If you are not already in love with him, I suggest starting with more Roger McGough (my poetry hero), Wish my inclination to write poetry was more regular. Sadly, it comes in fits and starts with a hugely productive period in 2010 and very little in 2011… I feel a resolution coming on!! I have somehow missed several posts, as my move from blogger to wordpress was taking place, your latest posts were not being updated…….I so wish I had seen this at the beginning of January, it is a post full of hope for the future whilst fondly remembering the past…….lovely Charlie, thank you, and stunning photos as well as words, as always. PS: Love the new look too, crisp and clean with style and personality…..
Hi there! I must know – where did you get your measuring cups?! They are GORGEOUS! I’m buying a set for a friend of mine in England, who once asked me if a “cup” in American recipes meant “any old cup from the cupboard” and this teacup set is exactly what I’m looking for!